Technology has become an increasingly central aspect of modern vehicles, with a plethora of on-board gadgets and gizmos such as satnavs and multimedia infotainment systems. Many motorists hugely enjoy these hi-tech features, but they come with a great risk in that they can be infiltrated by cyberhackers seeking to gain unlawful access to your vehicle. 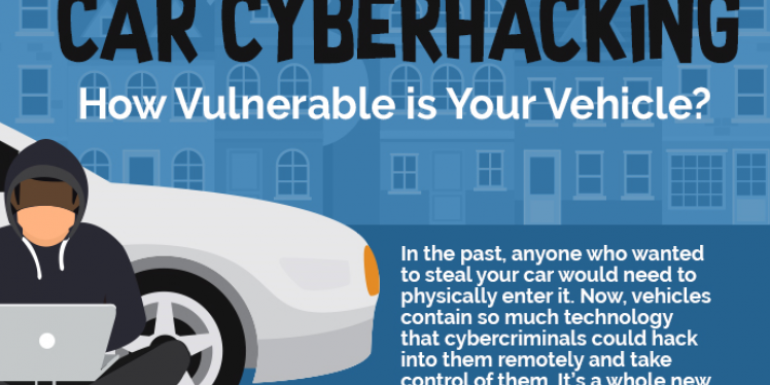 As this infographic from Woodstock Motors shows, car cyberhacking has now become a genuine threat. The more technology that a car contains, the more access points a hacker can infiltrate. For example, if you have a satnav in your vehicle, you probably save your residence as ‘Home’ when inputting your destination. It might be a timesaver, but it leaves you open to a cyberhacker accessing the system and being able to find out where you live. The satnav could also give hackers information about your usual driving routes, turning it into a de facto tracking device. The advent of driverless cars plays right into the hands of cyberhackers, as these vehicles connect with other cars and road infrastructure, creating even more access points for hacking. Perhaps there is such a thing as too much information after all. If you’re concerned about the possibility of your car being hacked remotely, what can you do to stop it? A simple yet effective solution is to wrap your keys in tinfoil when the car is not in use, as this greatly weakens the signal, making it almost impossible for cyberhackers to pick up. Another sensible idea is to disable any in-car technological features that you don’t use, as these all serve as access points for hackers when active. Cyberhackers are already well versed on how to infiltrate modern cars, so it’s up to the benign motorist to become aware of what they can do to make it as difficult as possible for hackers to do their thing.